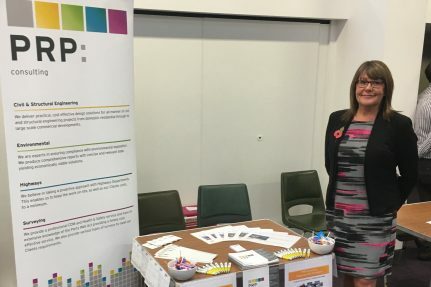 PRP’s Business Development Manager Dawn Morley and Graduate Engineer Sam Attewell recently attended the School of Architecture, Building & Civil Engineering Careers Fair at Loughborough University. The purpose of our attendance year on year at the Careers Fair is to meet and engage with students of a high standard who are seeking a third year work placement. It was great to meet so many students and talk to them about careers within our exciting industry. The successful candidates may also obtain a sponsorship agreement throughout their final years at University at which time they will join PRP as Graduate Engineers. PRP are currently recruiting students to join our expanding teams in both our Leicester and Northampton offices.